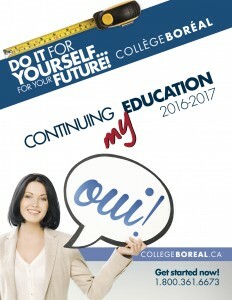 Collège Boréal is committed to the promotion of equal access to its programs, services and facilities. Persons who have disabilities, whether students, staff or other members of the college community, have access to a supportive environment for learning and work in order to achieve their full potential. Under the Accessibility for Ontarians with Disabilities Act and Ontario Regulation 429/07, Accessibility Standards for Customer Service, Collège Boréal is obligated to ensure that its goods and services are accessible to persons with disabilities. Collège Boréal is committed to upholding accessibility standards for client services which ensure that its goods and services are accessible to persons with disabilities in a manner that fosters their integration and equal treatment and respects their dignity and autonomy. Upon request, Collège Boréal will provide in an accessible format any document that is requested or required under these laws.